In a rare case, the RKO Keith’s Flushing Theater is an interior landmark, but the building it’s inside is not landmarked. Built in 1928 to the designs of noted theater architect Thomas Lamb, the elaborately ornamented Churrigueresque-style movie palace has sat decrepit for the past three decades, until Chinese firm Xinyuan Real Estate (they’re also behind Williamsburg’s Oosten condo and the forthcoming Hell’s Kitchen condo that will be anchored by a Target) bought the vacant theater for $66 million last year with plans to develop it into a 269-unit luxury condo. Moving ahead with this vision, they’ve tapped Pei Cobb Freed & Partners and preservation specialists Ayon Studio to erect a 16-story glass tower at the site, which includes plans to “enclose the interior landmark, and to disassemble, restore off-site, and reinstall salvaged ornamental plasterwork and woodwork and replicas” in a new residential lobby. Despite some opposition from the Historic Districts Council (HDC) regarding public accessibility, the Landmarks Preservation Commission voted in favor of the plan, congratulating the architects and expressing great admiration for their design. 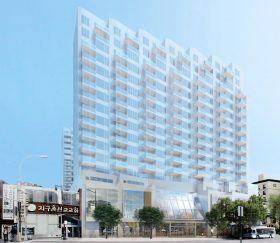 Over the summer, Chinese developer Xinyuan Real Estate filed plans to build a seven-story, 105,305- square-foot condominium at 615 Tenth Avenue in Hell’s Kitchen, their second NYC project after the Oosten in Williamsburg. The address had formerly been home to a Hess gas station until Xinyuan bought the site last January for $57.5 million. 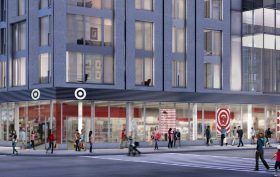 Their new 82-unit project, dubbed Hudson Garden, will also have a 29,000-square-foot retail base along the western blockfront between West 44th and 45th Streets, for which the Post reports Target has signed a lease. Back in 2012, Chinese company Xinyuan Real Estate Co. purchased a $54.2 million, 92,000-square-foot, Kent Ave. site in Williamsburg for its first development in the U.S. — which they said, of course, would be slated for a luxury condo building. Now it looks like their dev team is ready to kick it into high gear and Xinyuan has enlisted the help of Fortress Investment Group in the form of a $165 million loan. 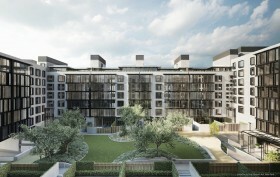 An interestingly enough, the project is the beautiful Oosten condo development designed by Dutch architect Piet Boon.